Version 0.3.0 released! Find it here: viewtopic.php?f=26&t=75209&start=80#p1217517 or on Bananas! So I decided to separate this topic from the ARRS thread so I could post updates without cluttering up that topic. The American Bridge Replacement Set is planned as a stand-alone bridge set as an alternative to TBRS. As the working name implies, it is meant to be a complimentary set to ARRS, but I'm not necessarily limiting the bridge designs to just the United States. In the future I'm hoping to include support for the road surface change available in ARRS, and maybe even additional road surfaces, but we'll see how far this goes. Who knows, maybe we'll get working RoadTypes by then? So far the designs reflect mostly bridge types that I commonly encounter, but I have other types not limited to my area, and I'm open to ideas. There are 13 available bridge slots in OpenTTD with 4 types each (one for rail, monorail, maglev, and road), and so far I have 4 slots filled up, with maybe 2 or 3 more ideas ready. The set isn't ready for a release yet, as most of the bridges are only partially implemented. But I thought I would share my progress on the bridges I was working on and maybe get some input from players before release. Mind that this is merely a mockup, but if you have any suggestions to improve it (or any of the bridges above), I'm all ears. Last edited by Andrew350 on Fri Jan 18, 2019 6:17 am, edited 5 times in total. One thing I hate about bridges is that they hide the vehicles on it, and the ground under it. I would love to see a sort of minimal bridge set, where the bridges are just a flat surface so you can see its users (like the first image with the 3 bridges). I'm really glad to hear this set is in the works! I've wanted to switch from TTRS infrastructure to ARRS for the longest time, especially since they appear to have similar features, but I like TTRS bridges quite a lot (especially that brick viaduct, that white tubular, and those gorgeous suspension bridges), and TBRS, for all its greatness and variety, isn't adjusted with OpenGFX in mind, so the styles clash quite a lot, and there's a few graphical inconsistencies. I definitely love the more minimalistic designs in the first picture, but intricate designs are great as well, and I think a balance of both would be best. Also, if you end up with a lot of designs on your hand, interspersing them throughout rail types like TBRS did (for monorail/maglev) might be a good idea? One last thing: if this is an aspect controlled by the GRF, making bridge lengths much more permissible would be really nice for those of us who play with larger maps. Having some really pretty bridges restricted to a maximum of 4 tiles for example is quite heartbreaking. I've only seen one covered bridge actually released. It looks horrible and not surprisingly it didn't get a lot of attention. Well, I'm probably not going to be your guy then I want to do all kinds of bridges, but I'm sure some of them will fit your style. Love the covered bridge! Being in New England, there are quite a few around. In fact, there's one just down the road from me. This one is in Conway, NH, in the Mt Washington Valley. There are a bunch around there, actually. Hmm, looking at your second photo, and thinking on Alberths point above, is it maybe more desirable to keep more of an open side view like shown below? I like the idea of being able to see the vehicles traveling through the bridge, but the static view looks a little odd to me, maybe it's too bright inside. But what do you think? Open side or closed? Open sides with a darkened interior (like the glass roofs of some station sets). I'd go open-sided. From a practical (real-world) standpoint, on a longer bridge it allows more light inside to better illuminate things. Driving across the first bridge is no big deal since its so short. The second one is pretty dark inside, even with open sides. Closed sides would be like going through a cave. I just found this site that has a ton of bridges, including breakdowns of types and construction methods. Maybe instead of straight beams you try them at crossed angles? That might cover it up too much though - not sure. I'd also change the road surface to be wood. That might help with the brightness too. Because I can't leave well enough alone..
That looks superb! I didn't even know you could do that with bridges. It definitely brings the light up and fits nicely, plus there's a whole lot less grey all over. 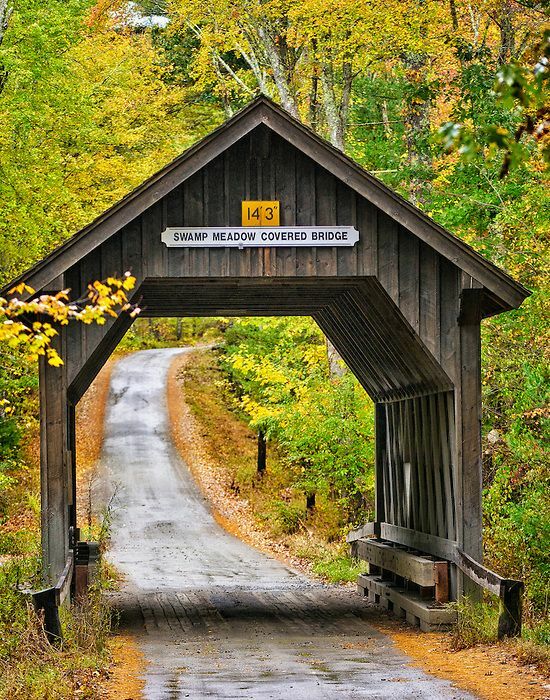 I'm not even the biggest fan of covered bridges but this one I'd roll with any day. I thought it was released as a NewGRF, but it looks like it was an EXE instead and I might have converted it to NewGRF just to play with it. Probably for the best. This is interesting. I am coding a bridge set for GarryG as well as working on my own bridge set. It's starting to look like we might need a "multiple bridge set" feature for our games. ... however these will work only with NMF and will crash OTTD BUT the 13-bridge sets will work in NMF as well as OTTD. An added note ... The NMF bridges allow bridges over stations as well as each bridge having it's own GUI icon. My Hartland Bridge! Yes, it will. It will be in my bridge set. Wow that looks great, I'll have to do that I'll try doing some cross members too since I agree it would look more interesting, as long as I can make it work without being too cluttered. I have yet to play the New Map Features fork, but I've watched it since the beginning and love what I've seen so far. I wish someday it could merge with trunk and become official - so many possibilities! Hi Andrew350 .. Like your bridges .. I too working on some bridges with Wallyweb and looks like we have similar ideas which is great .. you working on US style roads and I on UK/Australian style. Both looking at the idea of more common bridges in use. Some ideas what I been drawing. Wish you well with you projects. Too bad we couldn't have unlimited bridge styles, it might be nice to have some iconic bridges from USA/Canada and maybe eventually from around the world. Honestly though, if I where going to make an American Bridge set, I'd make each bridge type designed after major bridges, so for example, the short Suspension bridge could be modeled after a Brooklyn Bridge or Lions Gate Bridge, the second suspension bridge could be a Golden Gate bridge, and the Third and final Suspension bridge could be a Mackinac Bridge. If bridges supported the Action1/Action3 model, we could have 255 bridge sets. I'm in Ashtabula, Ohio (US), home of the nation's longest covered bridge. It was pleasant to see a covered bridge option! Interesting options and types of bridges. I'll wait for the release of the first version to try in the game. I wish you, Andrew350, success in working on American Bridge Replacement Set . And different types of American tunnels you plan to create?